The city of Ashburn is the county seat of Turner County, Georgia, United States. As of 2010, the city had a population of 3,792. Ashburn's government is classified as a council/manager form of municipal government.The City Manager of Ashburn is Ben Taylor. Ashburn is noted for its peanuts and a fire ant festival. Ashburn boasts a large peanut monument and is home to the Golden Peanut Company. The town of Marion was founded in 1888, and changed its name to Ashburn when it was incorporated in 1890. Ashburn was designated seat of Turner County when it was established in 1905. The community was named after W. W. Ashburn, a pioneer citizen. The legal organ for the City of Ashburn is The Wiregrass Farmer. Ashburn is located at 31°42′16″N 83°39′14″W﻿ / ﻿31.70444°N 83.65389°W﻿ / 31.70444; -83.65389 (31.704378, -83.653786). According to the United States Census Bureau, the city has a total area of 4.6 square miles (12 km2), of which 4.5 square miles (12 km2) is land and 0.04 square miles (0.10 km2) (0.66%) is water. As of the census of 2000, there were 4,419 people, 1,624 households, and 1,117 families residing in the city. The population density was 978.6 people per square mile (377.5/km²). There were 1,846 housing units at an average density of 408.8 per square mile (157.7/km²). The racial makeup of the city was 65.22% African American, 32.59% White, 0.09% Native American, 0.23% Asian, 1.65% from other races, and 0.23% from two or more races. Hispanic or Latino of any race were 2.67% of the population. There were 1,624 households out of which 33.8% had children under the age of 18 living with them, 36.1% were married couples living together, 27.3% had a female householder with no husband present, and 31.2% were non-families. 27.6% of all households were made up of individuals and 12.0% had someone living alone who was 65 years of age or older. The average household size was 2.68 and the average family size was 3.28. In the city, the age distribution of the population shows 30.7% under the age of 18, 12.0% from 18 to 24, 24.1% from 25 to 44, 19.6% from 45 to 64, and 13.6% who were 65 years of age or older. The median age was 31 years. For every 100 females, there were 83.4 males. For every 100 females age 18 and over, there were 75.7 males. The median income for a household in the city was $18,702, and the median income for a family was $21,481. Males had a median income of $22,328 versus $16,269 for females. The per capita income for the city was $10,786. About 29.6% of families and 38.1% of the population were below the poverty line, including 53.6% of those under age 18 and 29.3% of those age 65 or over. The Turner County School District holds pre-school to grade twelve, and consists of one elementary school, a middle school, a high school, and a speciality school. The district has 126 full-time teachers and over 1,914 students. Ashburn is served by a public library, the Victoria Evans Memorial Library. 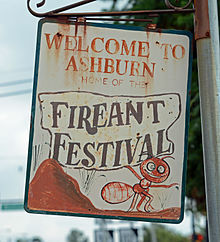 Every fourth weekend in March, Ashburn holds the Fire Ant Festival. This offers an art show, carnival rides, a car show, strawberry cook off, BBQ competition, health show, and fireworks. Some events are tailored to the festival itself, such as the Fire Ant Call, Find the Fire Ant, Fire Ant 5k, and Miss Fire Ant Pageant. Captain Henry T. Elrod - United States Marine Corps fighter pilot who was posthumously awarded the Medal of Honor for his actions in defense of Wake Island in December, 1941. ^ Hellmann, Paul T. (May 13, 2013). Historical Gazetteer of the United States. Routledge. p. 217. Retrieved 30 November 2013. ^ Krakow, Kenneth K. (1975). Georgia Place-Names: Their History and Origins (PDF). Macon, GA: Winship Press. p. 8. ISBN 0-915430-00-2. ^ Georgia Board of Education[permanent dead link], Retrieved June 29, 2010. ^ "Homepage". Victoria Evans Memorial Library. Archived from the original on 7 September 2008. Retrieved 30 July 2014. Wikimedia Commons has media related to Ashburn, Georgia. This page was last edited on 25 February 2019, at 21:05 (UTC).